I bought these as a cheaper alternative to Ortliebs panniers. So far they have performed flawlessly. They are not quite as well made as a pair of Ortliebs, but I suspect they will last a long time. These panniers are really tough and were just the right size for the bit of extra space I wanted on my front rack. I needed them for a short cycle tour and they didn't a great job. Didn't manage to test their waterproof properties but they seem perfect for rainy weather. You have to assemble the rack fittings after buying but this is quite straightforward. Impressed so far! ConsNone that I can see yet! ProsExcellent product, waterproof, durable, great rack fixing. New to Carradice products but was curios as to how they compare to Ortleib. I am pleased to say that I was very pleasantly surprised by the quality and durability of the products and will definitely be making further Carradice purchases in the future. I very happy with these, they're exactly what I wanted. They're neat, sturdy, absolutely waterproof, and easier to adjust and take on and off than my last panniers were. I wanted small ones: I do shop, but don't carry the week's provisions or building supplies. I commute to a college to work, and often need to bring A4 stuff, some clothes, shoes, sometimes the computer. It's fine. And my heels do NOT knock into them on the backpedal (with bigger ones, it does happen). I bought these because the old ones, also Carradice, were actually disintegrating. Fair enough, after about 30 years hard use, and in fact a tribute to the durability of the folks' products. p.s. Someone really should rewrite this stupid word processing program, though. Apparently a semicolon or hyphen is too much to ask. Tidy But Not Big Enough For Shopping! disappointed at having to assemble the attachment system. About as easy as trying to edit these comments, which disappear if you try to insert a capital letter, say. Will these fit on an axiom DLX low rider front rack? Not sure we have ever fitted them, but cannot foresee any issues. Please could you confirm if the Carradry front panniers are the latest ones, the picture is of the previous version as the strap brackets are different on the newer ones. The current stock, at time of writing, was received less than a month ago and is the most up to date. Can I use these with the Axiom Journey DLX Low Rider rack? Would it be possible to purchase an additional 2 rack attachment clips (one more for each side) for the Carradry panniers? I am going to be traversing some very bad roads while touring and I worry that one clip on each side will holding panniers sufficiently stable. As well as the main clip there are 2 hooks supplied with each pannier. There are replacement clips available though which are SJSC part number 33623. Hi There Quick Question? Will These Fit The Blackburn Low Rider Set Up? Many Thanks For Your Reply. Due to the upper flat plate design used on the Blackburn racks you won't be able to use the centre safety catch but otherwise you can fit these panniers to your Blackburn rack. Is it a 20L capacity in total, so 10L each? 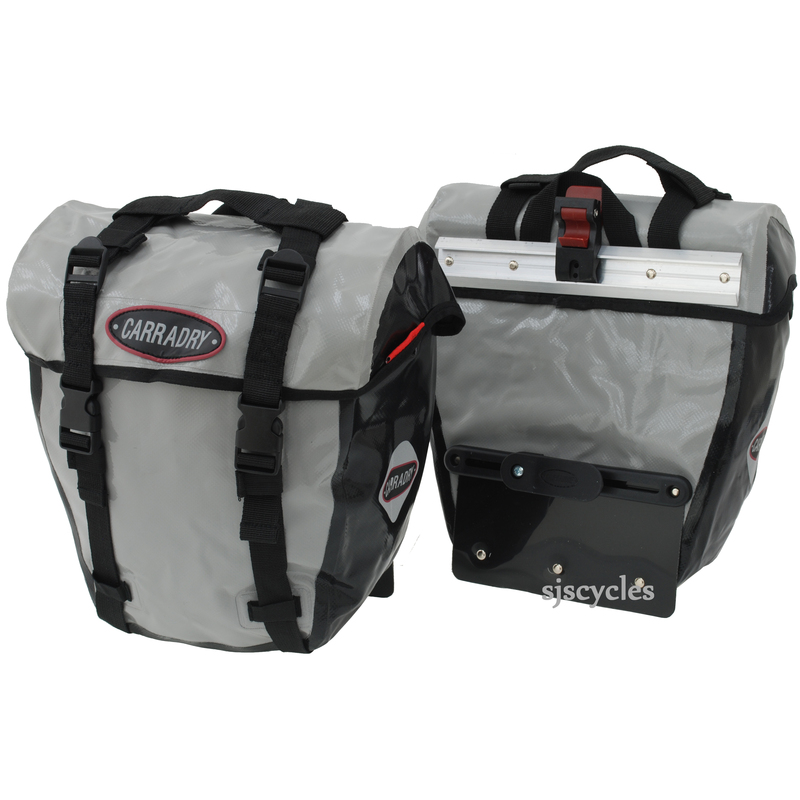 Or is a single pannier 20L and sold as a pair? These are sold as a pair so the 20L Volume is for both combined. Which would indeed mean 10L each.